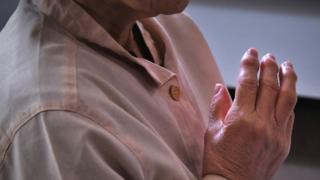 Last month the BBC reported on the increase in the numbers of elderly Japanese being imprisoned. The biggest spike is among elderly women. One 68-year-old serving her fifth jail term - this time for stealing fruit - tells 100 Women why she did it. I was jailed for the first time when I was 53 years old. I think I stole a bag. My prison term this time is two years. It's not that I'm shoplifting all the time - I steal when I feel cornered. The first time I did it because there were tensions at home. One of my children wasn't going to school and I was feeling annoyed. Another time I was blackmailed by another prisoner who said she would tell everyone I had a criminal record unless I shoplifted again. I think she saw my address when I received letters. I didn't want her to tell everyone so I did it. This time I shoplifted fruit because I have diabetes and I love sweet things, and I couldn't stop myself. The type of fruit I took [grapes] was something I couldn't afford to buy. But I was also stressed because my son is living at home with us with his child after his marriage broke down, and hasn't got a job. I shoplifted after we argued. It's hard. He gets bored quickly and left his job. I told him we didn't need a lazy person in the house. There are many people here who committed crimes because they didn't get along with their children. They feel lonely. The children have their own life, and they have no time to care for their parents. I don't want to shoplift again. I want to be strong, not to respond if threatened, and I will be patient about sweet things. I definitely don't want to come back here. I'm old, and it's hard to live here. I can't keep up with everything. My husband says what's done is done. He says he's sorry that he didn't understand me. He was injured while I was in here so I want to take care of him when I return home. Young people are having a hard time in Japan but I hope they take care of their parents. Otherwise it will create loneliness. For many inmates who have shoplifted, it was not that they didn't have any food to eat, but they wanted to save their money because the food was just there to take. I see the prisoners' profiles when they first join the prison workplace, and often they have stolen just one rice ball, or a few items of food which cost about 1,000 yen (£7). I'm in charge of a workplace that looks after repeat offenders, and they have been abandoned by their family. They are lonely and isolated. In prison they have food, clothing and shelter, and they might have an acquaintance or friend here. They feel more secure inside prison than outside in society. When they got out of jail they said they would never want to come back but once they were out, because they had a criminal record and were older than 60, they didn't have many relatives to depend on, no friends, and wondered how they could live their lives. So they shoplifted again. I'm concerned that people like that will increase.